Today 3D printing is more and more popular in the world. Rapid prototyping companies are helping investors turn their ideas into real products faster. 3D printing techniques are also allowing engineers and designers the freedom to relook at their design, making revisions easily and cost effectively compared to other traditional methods. 3D printed prototypes make all the difference when the need is to convey an idea properly or when it is necessary to ascertain a product’s functionality in the real-world before running mass production. Our Rapid prototyping services also allow business to pursue rigorous testing, evaluation and refinement of the prototypes as necessary with reduced time frame between revisions. Our 3D printers accept and process a wide range of materials to deliver the exact solutions what you are looking for. A full spectrum of materials such as photopolymers, thermoplastics, metals and composite materials that can withstand any secondary processes like sealing, polishing, painting, anodized or electroplating can be produced by us. From the delicate to the ultra-tough, from complex and micro designs to large object manufacturing, UYEE has all the resources in place to help take your ideas to the real world. When you are looking for help with aluminum machined parts, you know that there are a variety of factors. Not only do you have time limits, you also have a budget which is why many choose us. Over the years, UYEE has developed unique processes and custom engineering so the demands of our customers can be met. With our CNC aluminum machining expertise, we try to set ourselves apart from the competition by combining technology, skills, experience, and knowledge. 1）Since they can be used for CNC machining and milling in shorter time periods, they become more economical and the sensible option for most. 2）As soon as the material is exposed to the atmosphere, a protective layer forms which provides resistance to corrosion in addition to more strength. Furthermore, the likelihood of seeing rust will also fall. 3）Among other things, machined aluminum components will be malleable, strong, chemical-resistant, and a conductor of electricity which has its obvious benefits. For these reasons, we have decided to spread the word and get more people interested in this niche. Now, we stand as one of the leaders of machining aluminum and we want to stay here for some time to come! When your demand is a highly accurate and repeatable system with the ability to work on different substrates and scalable volumes with fast turnaround time and is economical at the same time, look no further than UYEE’s CNC Machining services. As a company in the centre of the new wave of 3D technology in rapid manufacturing, we are completely tuned to absorb the CNC machining requirements you may have. We can hand-hold you through a variety of CNC Machining services including but not restricted to milling, turning, EDM and wire EDM and surface grinding using a wide range of plastic and metal materials. Our services extend from manufacturing of Metal Prototype to making mold tools which may be used for injection molding or pressure die casting irrespective of the complex geometry or, the hardness of the material you want to work with. We offer general tolerances of DIN-2768-1-fine for metal and DIN-2768-1-medium for plastics. We are well-equipped to offer you a wide range of plastic and metal materials including Magnesium, Steel, Aluminium, Brass and Titanium. Working with customized raw materials is also possible and we are always open to discussions about your precise needs. When your project requires a production-quality prototype part, look no further than UYEE’s Rapid prototyping machining services. Using traditional manufacturing methods, such as CNC machining, turning, and 3- and 5-axis milling, we can turn your design into a fully featured prototype in as little as 1-3 days. We deliver to you an exact part, made from the correct material that can be used for form studies, fit-checks, and functional testing. 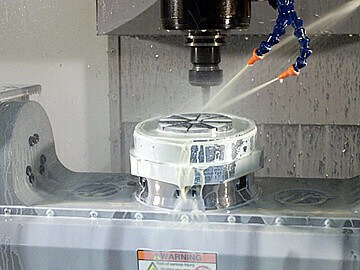 Our CNC Machining service includes mills, lathes, and routers, with our designers and engineers able to rapidly speed up the production of your parts by programming these machines to precisely fit your manufacturing requirements. Because of the diversity of our expertise, the depth of our industry partnerships, and the variety of our technology, we’re able to significantly help you cut production time and costs. Although 3D printed shapes might be acceptable for concept or trade show models, they cannot compare in quality and functionality to a machined alternative. We can produce CNC Rapid Prototype parts much larger and more quickly than 3D printing technology allows. Our shop also handles short run and full production orders, giving you the comfort of having a supplier capable of manufacturing the part after the concept is proven.